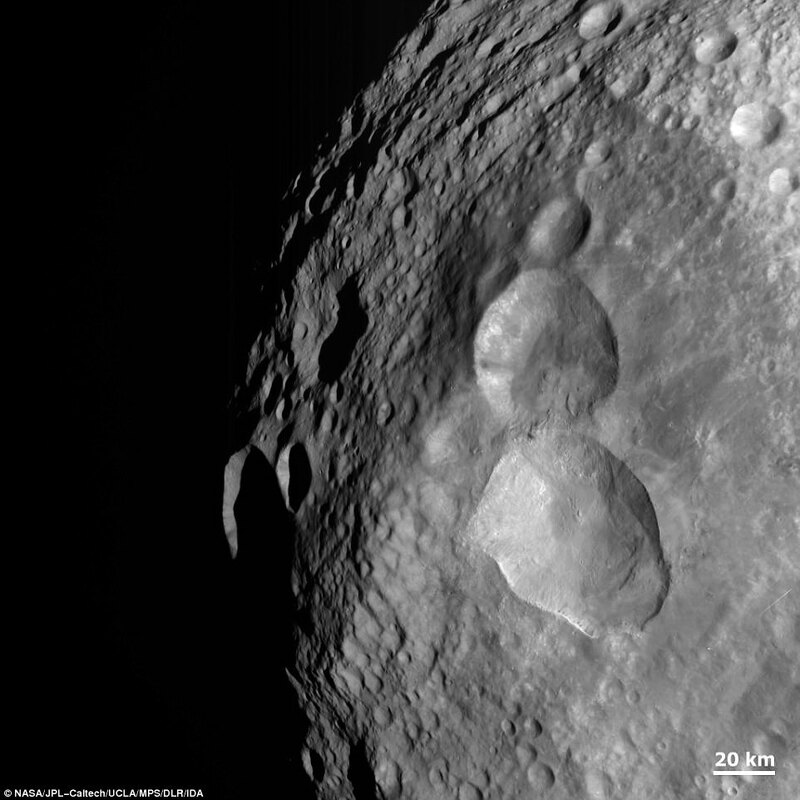 As asteroids hurtle through space, collisions with other objects can leave them speckled with craters of varying shapes and sizes, creating a pock-marked surface with no apparent organization. Sometimes, however, these impact craters align in just the right way. NASA has shared a remarkable image of an asteroid that appears to have a snowman imprinted on its surface, thanks to three ‘well-placed impacts’ stacked atop each other. The festive image, shared by NASA this week, was captured by the Dawn spacecraft back in 2011. And, the likeness is unmistakable. The three circles situated on the surface of the asteroid, one on top of the other, even vary in size like a real snowman on Earth, with the largest at the bottom and the smallest on top. It was captured with the clear filter on the spacecraft’s framing camera, with a resolution of roughly 260 meters per pixel. ‘Do you want to build a snowman?’ NASA tweeted alongside the photo, in nod to the popular song from the movie Frozen. The Dawn mission blasted off in 2007, and orbited the giant protoplanet Vesta from 2011-2012. Now, it’s exploring the dwarf planet Ceres. While NASA’s spacecraft continue to gather critical information for understanding planets beyond our own, the work isn’t always so serious. Much like the ‘snowman’ asteroid, the space agency has revealed numerous images that appear to show recognizable objects on other worlds – including smiley faces. An image captured in 2015 by NASA’s Mars Reconnaissance Orbiter (MRO), which has been in orbit around the red planet since 10 March 2006, revealed a face-like feature at one of many monitoring sites at the South Pole residual cap (SPRC) on Mars. This is a region where carbon dioxide ice can be seen shifting throughout the year as the Martian climate changes. The face appears to have a nose and even an upturned mouth to denote a smile. In the image the face is approximately 1,640ft (500m) across. The features highlight different levels of elevation, and also different ice densities, on the surface. Pareidolia is the psychological response to seeing faces and other significant and everyday items in random stimulus. 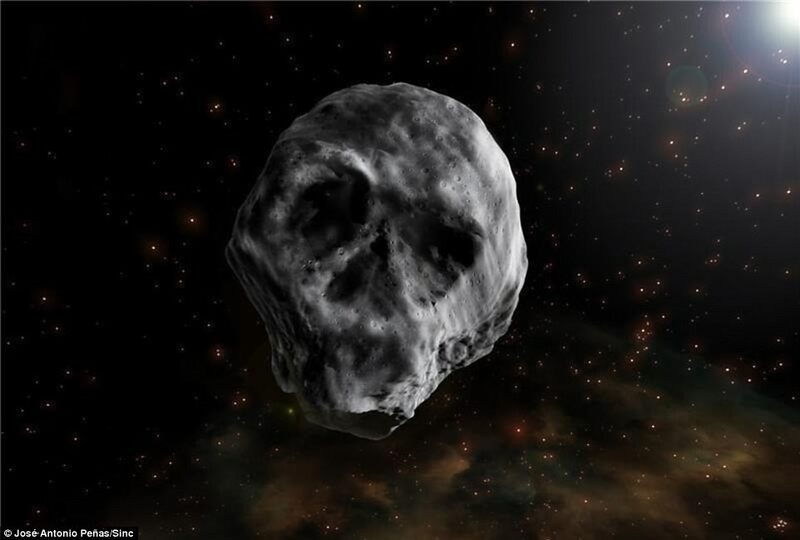 And, the space agency revealed just this week that Earth is set for another ‘spooky’ encounter with a 700 meter asteroid that looks uncannily like a skull. It’s not all that uncommon to see familiar objects, or even faces, in random stimuli. Experts say the phenomenon is a psychological response, known as pareidolia, in which unrelated patterns appear to form a recognizable image.